From one milso to another. .. I know how proud we are to become or to be a milso that we tend to post as many pictures as we can with our spouse or of our spouse, but we have to remember that our spouse’s profession is dangerous. Facial recognition, name and rank can makes it easier for the enemy to locate not only your spouse but you and your family as well. It makes your spouse an easier target. My advice is try to limit the amount of pictures you post with your man with his cammies on. If you post a picture of your spouse in uniform then be as vague as possible. i.e. back view, side view, blur out name tape etc. Protect him. Shield him. Support him. Love him and honor him. We have been a part of the special operations unit and we were taught the importance of privacy. We are very cautious of our surroundings and have learned so much from being a part of it. Just because your profile is “private” doesn’t mean it is safer or that you are protected. Anyone can hack into your account if they really wanted to. This is where the saying “better safe than sorry” comes in. Wouldn’t you want your hubby to be safe? Especially if and when he deploys? Keep your pride up high but be careful how and what you post. I am a proud military wife, I wear the motto shirts to show my pride, when my husband brings home a unit shirt for me, I wear my shirt around the house etc. But I am not the wife you will find putting a big sticker on my car that says proud military wife/girlfriend or posting pictures of my husband in his uniform on social media. I don’t want to be a target when driving my car alone or a target on social media. I am also not that wife that will announce that my husband is deploying or is deployed. I never say where he is deploying to either. We have to always keep in mind, not everyone supports the military. There are evil people in our country that will use us as a target. So again, be careful what you say, what you post and who you trust. Learn about the military do’s and don’ts and rules from your husband or from another spouse who has been in the game for a while. Your best bet is to contact your Family Readiness Officer (FRO). Don’t depend on hear say. Ask your husband to teach you what you need to know about being a military spouse. Ask as many questions as you can to make yourself aware of everything that is going on or will be going on in your future. 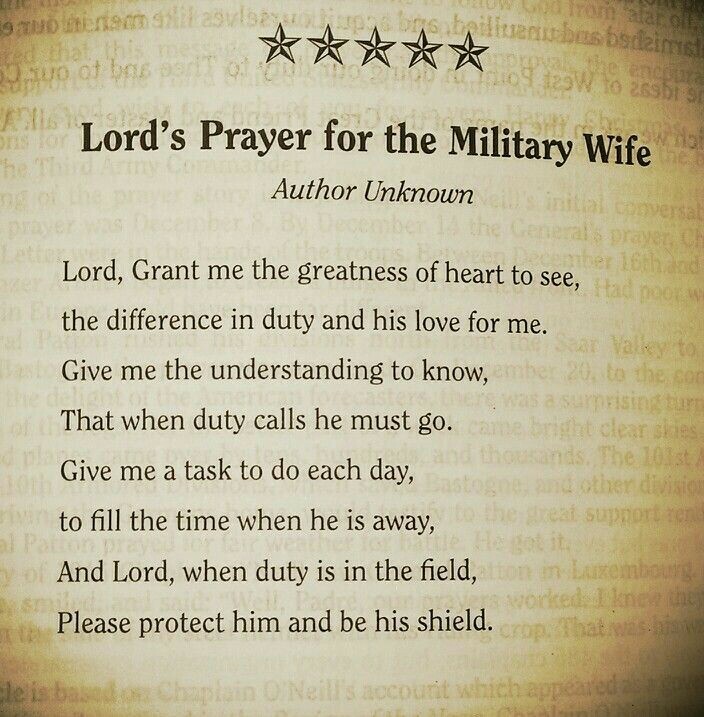 What has helped me throughout the years of being a military wife is that my husband always kept me in loop with everything, I mean EVERYTHING! Sometimes I feel like I’m the one in the setvice and not him lol. I don’t want to be that “wife who knows nothing” or “she’s just the wife, she won’t know”. Ummmmm…. Excuse me????? Ohhh no…. I’m that wife that if he is busy and you have a question, I am able to help you with it. I’m that wife that is sitting in his office and his guys come walking in to talk to him about an issue, notices that I am there, excuses himself but instead I excuse myself because I know what’s going on or because I know the extent of how serious it is…. Educate yourself so that you are able to support your spouse in a way that no other will be able to understand. Be that wife that your husband can be proud of. Don’t be that wife that constantly complains when your husband comes home from work exhausted because you don’t understand and have no idea what it is he does all day. (Especially if you are a stay at home wife). Don’t be that wife that says “I don’t know what he does but he is a Marine/Sailor/Soldier/Airman. Everyone in the military has a job title, learn it as well as learning his rank! Learn the rank structure so that you can help him get to the next rank. If you don’t understand the rank structure and what it comes with then you won’t be able to support him and push him to get a promotion. There are so many courses and classes for your spouse to take to better himself and allow for a better future for the both of you. Make sure you soak in as much as you can now so that when you become a higher ranking wife like me, you will almost know it all! Also, they say not to wear your husband’s rank on your shoulder but when you are in his world, you have to!!! What I mean by that is, don’t go arpund boasting about what rank your spouse is. What I mean is, you will need to know how to act and conduct yourself around his higher ups. You are a representation of your husband so don’t embarrass him or do anything that would jeopardize his position. My husband has been in for 20 years now and still going strong. If I can’t help you or answer a question you have, he will definitely be able to. I am here to help you.